Chef Sakai was so sweet and agreed to sit with me on camera, but is a bit camera shy, so I did all the talking (I was unrelenting and wanted you all to see and meet him so you could say hi when you go in). But off camera...man! He has so much information and is a wealth of knowledge! 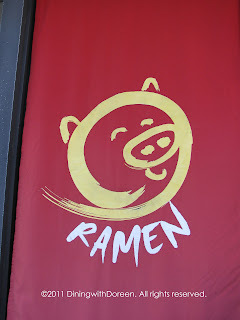 He's so cool and his passion for his ramen and the tonkotsu soup is unreal! This guy takes his ramen making very seriously. 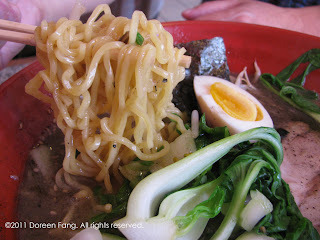 I am not a ramen expert by any means but the things that I do know, I will share with you. I know what I enjoy eating, the textures, the ingredients, the flavors. 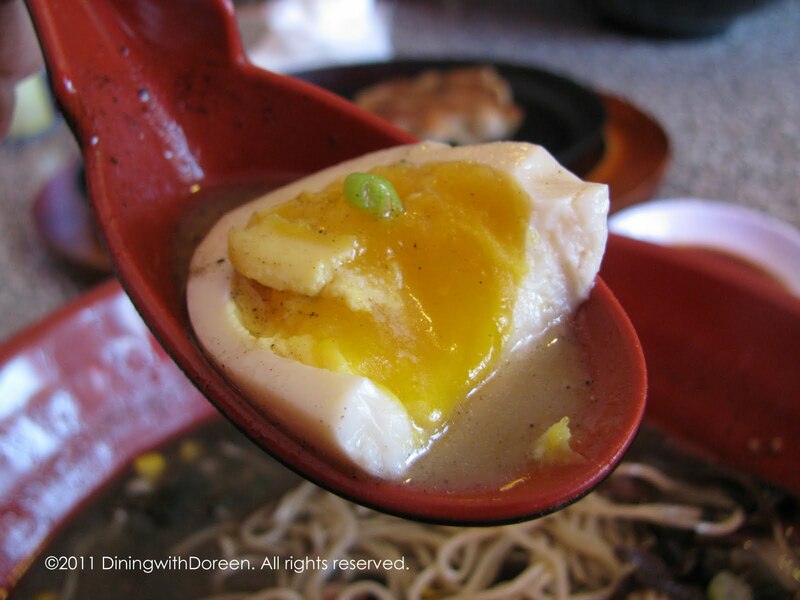 The Hakata ramen has the thinner noodles so that the thick, rich, fatty soup doesn't cling to it as much and make your lips all greasy. 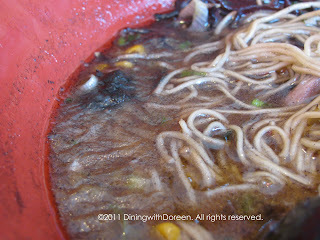 You can see the black garlic oil film and bits of the black garlic. I know you're all thinking what I'm thinking...better check your teeth before you go out in case you have little black bits all stuck inside your teeth. The chashu is extremely tender when you bite into it and there is just the perfect amount of fat on it that makes you wish you ordered more for your two extra sides. In fact, I think I'm going to get extra chashu and extra green onions. THAT would be heavenly. You can see the thicker ramen noodle that is typically served with the shiyo, or shoyu ramen because the soups aren't as heavy and thick so you want the soups to cling to it as much as possible. Oh how I love my egg yolk undercooked. I just want to take another bite of this right now!! 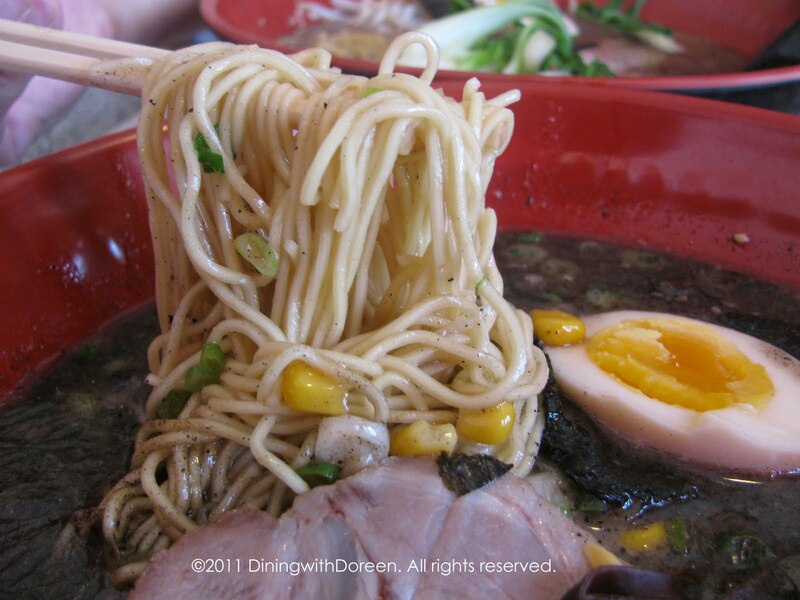 First of all, you HAVE to order gyzoa when you eat ramen. And when you come you here...it's an absolute must! It comes out sizzling on the hot plate and they are a great size. Not all skinny and store bought. You know which ones I'm talking about. 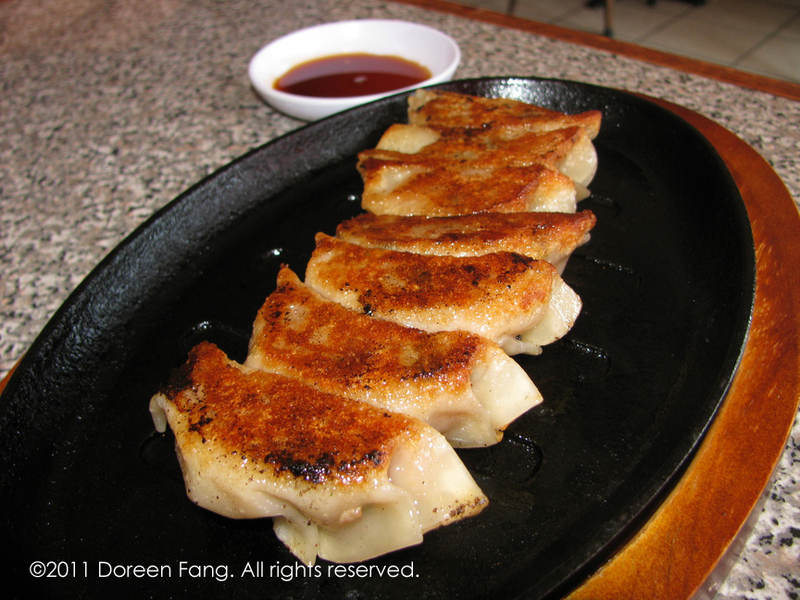 So many places use frozen gyoza, but these are all made by hand in store. These are delicious...*sigh* look at how perfectly golden and crispy the bottoms are! You know you want to just pluck one up, dip it and eat it! I have to say, these are my favorite gyozas so far of any Japanese restaurant I've been to. Thank you Chef Sakai! This picture of the coagulated layer on top of the soup is to show you the gelatin that was released from the pork bones during the cooking process of 30+ hours, and then the continued addition of more pork bones to add even more flavor and release more gelatin which makes the thickness of the soup. Ok, this is nothing like the mango pudding you get at Chinese restaurants. 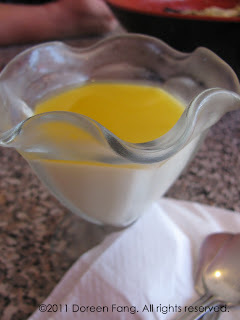 It's much more tender in consistency, but what I absolutely loved about it was the mango syrup on top! Wow!! Incredible punch of flavor! Yum! And even better...IT'S FREE!! Yippee! I love dessert! I swear, the older I can't I just can't stop eating dessert! WTH! And lastly, for all you food eating competitors...they have a ramen speed eating competition coming up. Don't worry, you don't have to eat 20# of ramen to win...you just have to eat fast! This is nothing like my pho eating competition! 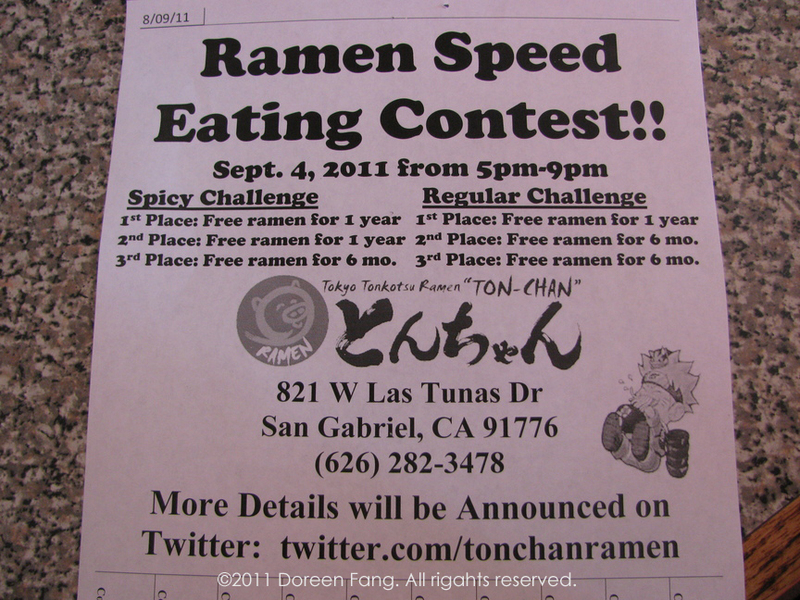 For more info you can go to their event page on Facebook or go to www.twitter.com/tonchanramen. Many thanks to Chef Sakai for sharing the intimate details of his kitchen and recipes! Yukiko-san for your hospitality and the rest of the guys in the kitchen and waitstaff for your! Chef Jay Terauchi for the intro and filming!! Check out Chef Jay's blog, http://www.kahunaofthekitchen.com/ . The dishes shown by you are very appetizing and I do not doubt that they taste very tasty.